In this article I’m going to explain the importance of structuring your training properly to maximise results, enjoy your chosen sports more, avoid injury and generally perform at a higher level. Because of the kinds of our area of expertise and the kinds of events and sports our members at Joe’s Basecamp Gym lean towards my main focus is on training for outdoor endurance sports and adventure sports and any activity where the energy output is sustained for more than ninety minutes or for hours, days or even weeks. Whether you are here on the Northern Beaches or elsewhere training for running, kayaking, mountain biking, obstacle course racing, adventure racing, open water swimming, mountaineering, trekking, hiking or bushwalking, endurance training using the right energy systems is critical to you. Apart from sustained energy output the other common denominator with most of these sports is bodyweight, with possibly the exception of the water sports. For ease of work we want to be as powerful and as enduring as possible, but at the lightest weight possible…. we don’t want to be lugging excessive Kg’s up hills or along trails. In Part II of this article I will also explain where and why maximal strength training is very much a necessary part of training for all of the above activities as well. So a basic summary of your needs is to have as much endurance as possible and have as much strength as possible, whilst having as little excess weight as possible, will improve your performance by degrees. The kinds of events and adventures we lean towards at Joe’s Basecamp Gym mean moving for many hours to many days at a time. This is the heart of endurance and what the human machine is built for. Way back when, when we were still running around chucking spears at each other, we were the most efficient hunters. Our intelligence and some team work, coupled with our body’s muscle structure, cooling system and fuelling system allowed us to hunt prey much much bigger, faster and stronger than ourselves and just wear it down over time, tracking and harassing it, until it was exhausted and we were able to kill it. Most people have a rudimentary knowledge of cardio based training and fuelling for it. They have been taught that the more we do it and the faster we do it, the fitter we get and that to fuel for it the fastest and best thing to do supplement with carbohydrates to stop us running out of energy. For the uninitiated I’m just about to turn your world upside down. I’m sure you’ve all seen the middle aged cyclists, squeezing their little tummies into very tight bike shorts and shirts, there certainly aren’t a shortage of them here in Brookvale on Sydney’s, Northern Beaches . Maybe you are one…. are you struggling to keep your weight to what it used to be? You’ve been reading up on how to maximise your performance by taking so much Goo and gels, to keep your fuel levels up and you are still training hard as you can, going as hard as you can on your long runs because it feels good to go faster. Adding in hard bricks, intervals and hills on a regular basis but getting a little tubbier every year? Why? In this article we will deal with points 1 and 2: In this article I’m going to try and get through to you about how important it is to be strict on staying within the right energy systems and zones for the right amount of time for overall improvement. This isn’t about what feels good now, about what you “feel” you can do or what you can fit into your schedule.It’s purely about what science has shown us works to improve performance overtime. If you are not where you want to be but still insist on saying “but I know my body” even though it flies in the face of science …. just keep doing, what you are doing and good luck. This is based on evidence based research from some of the most highly thought of Exercise scientists, physiologists, strength and conditioning coaches and many, many endurance athletes across different disciplines. The body will head towards Glycolysis first as it is easy and fast but in reality not as efficient for our purposes. If the body runs out of Glycogen… our performance nose dives, commonly called “bonking” wobbly legs, disorientated unable to maintain any form of momentum. So if we can train the body overtime to rely more on aerobic lipolysis we can tap into fat stores whilst making a minimal dent in the 2000 calories of Glycogen that we have stored in the liver meaning we can use that glycogen for emergencies … whether that be a real emergency (think back a couple of thousand years… getting out of way of a sabre toothed tiger …. or a modern emergency a hard 1 hour finish to a race). To steal an analogy from Steve House (Mountaineer) and Scott Johnston ( S&C Coach in their text “Training for the New Alpinism: A Manual for the Climber as Athlete” We need to look at your training as building a house. The bigger the house the more solid and deeper the foundations need to be. You wouldn’t start working on the roof and the detailing until the foundations had been laid and then the walls etc. Your High Intensity training and max efforts are the roof of your building. To do this properly we have to put layer on layers, brick on brick; we need to build this house from the foundations up. It is essential to build a solid aerobic base as these are your foundations. If you do this properly, the pay offs are massive. This is where the vast majority of your time and effort should be spent, again to take another analogy from Scott and Johnston “You can never have enough money in the bank” . It takes time and patience something unfortunately that people don’t seem to want to spend their time. The aim is to make yourself as efficient as possible within that sub maximal range i.e. How far can you run over time without making a dent in your stored glycogen so you always have that in reserve. So during base phase training your goal is say on a 1 hour run, in a fasted state to see how far you can run with your heart rate STRICTLY remaining below but as close to 75% as possible. At Joe’s Basecamp Gym we use fasted state training for the majority of our Base Phase training, remember we are looking to improve the systems we use. So it may take some adjustments to get used too…. no more refuelling. If we refuel from external sources we are defeating the object of what we are trying to achieve. There may be a dip in performance at the start… stick with it, done properly and over time you are looking at a really big game changer. During our events and during our specific/pre comp training phase its a different matter, we will fuel but that will be explained on another day. In their paper: Intervals, Thresholds, and Long Slow Distance: the Role of Intensity and Duration in Endurance Training, Doctors Stephen Seiler and Espen Tønnessen hypothesised that elite runners, cyclists, rowers, swimmers, and cross-country skiers all do about 80 percent of their training at low intensity and less than 20% of their training at or near lactate-threshold intensity (corresponding to intensities of ~85% of maximum oxygen consumption). At Joe’s Basecamp Gym we often see your average person just getting fit or starting their endurance journey who before seeing us has actually ended up spending a lot of time in 75-85% of max heart rate… known as the black hole. It is Dr Seiler, a world renowned expert in Endurance Physiology who coined the phrase “black hole training” meaning training at a level where an athlete’s high-intensity effort is performed too slow and the low-intensity effort is performed too fast, resulting in every training effort being performed at medium-intensity….which accomplishes nothing. In a series of really interesting case studies, they massively reduced the amount of HIT (High Intensity Training) the athletes did and even their Lactate threshold work and focused on doubling the volume of the training that was done at Intensity Level 1 of the table above (less than 75% MHR). In the two case studies all the Olympic level athletes improved Body mass, VO2Max and Lactate threshold even though they reduced their lactate threshold training enormously. Amateur endurance athletes spend so much time flogging themselves during endurance training, trying to get faster, burning fuel inefficiently and increasing risk of injury and then over refuelling, whereas pro’s spend at least 80% of time working at sub maximal paces and getting gains and consistent improvements. If we build a solid base here and improve our maximum aerobic capacity (the capacity with which we can work without breaking into glycolysis), our efficiency and pace and depth we can dig when we do need to train and work at higher thresholds is much increased, meaning that even though we spend less time there the training effect of that 20% is much greater, making us stronger, faster and more powerful. A solid aerobic foundation can take anywhere from 12 to 24 weeks to build depending on your previous training, endurance experience, current level of fitness and also dedication. 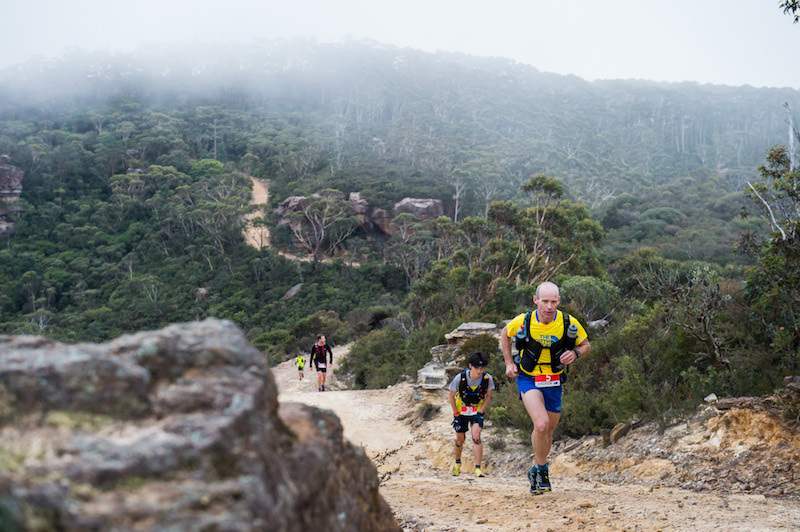 Base training is repetitive, whether you are running or riding or hiking; it’s about volume. …. “but I get bored” I hear the ADD generation cry, “ I don’t have time, what can get me there quicker?” ADD cries again. You can take short cuts but if you do, I guarantee that will never know how great you really could have performed if you had laid the correct foundations. So how do you program for success? The following tables depict total training volumes for one of our high level intermediate/ low Level advanced level endurance running based clients. In Part II, my next article, we will be dealing with Point 3: Rounding out your programming properly. Why all elite level endurance athletes and Joe’s Basecamp Adventurers use maximal strength training to improve performance, reduce injury and make us more robust in all our endeavours. Intervals, Thresholds, and Long Slow Distance: the Role of Intensity and Duration in Endurance Training by Doctors Stephen Seiler and Espen Tønnessen. Make your enquiry here. Make sure you type ONLINE SPECIAL OFFER into the additional comments.